Yes, that´s a quick charger. Welcome to Portugal. Cool. There is one quick charger within range that has a huge solar canopy over it. Maybe one day this fall, I'll head out that way and use it. Malm, Congratulations!. Three Bars Gained, wow! I love your Ev with Quick Charger at the end of your double rainbow. Nice video. Lots of fun you've had in 51k kilometers. Yesterday i took it to test some snow. It was fun, like always. So it goes from 100,0% to 0,0%. Like a new one. But 100% SoC is not the same energy as in a new one. Today was the day of the annual check. 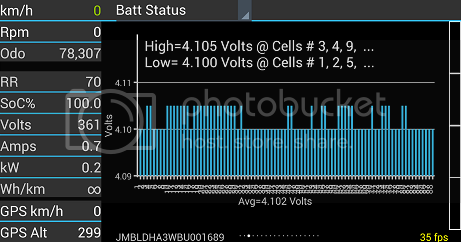 I was interested to get the current battery capacity, and they found it to me: 35,0 Ah. (24/7/2015 - 81748 km - 35,0 Ah). The last measurement was 6/3/2014 - 61821 km - 36,4 Ah. So, now that I'm keeping my batteries cold, loss of capacity is approximately 2% an year. . Feel like moved to Canada or Norway. Malm wrote: Today was the day of the annual check. 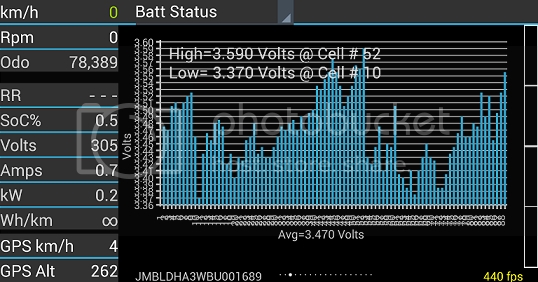 I was interested to get the current battery capacity, and they found it to me: 35,0 Ah. "If replacing the traction battery, reset the traction battery capacity information and the control information…(7) If the value, item No. 23: Battery current capacity, satisfies 45.0 − 48.0 Ah, go to the step 10." A new battery should have a battery current capacity between 45.0 Ah and 48.0 Ah. Malm has approximately 75% (35.0 Ah/46.5Ah x 100%) of new battery capacity after a little over 50,000 miles. So, 3.8% in 16 months. I made my calculations with 50 Ah inicial capacity. This 3,8% is less energy then 3, 8% from 50 Ah, so it doen't mean the same thing in lost of range.